Earlier this week the Patriot-Ledger asked “Have you had a penny lick, a hokey pokey or a toot today?” The paper went on to explain that before cones became the preferred holder, ice cream was eaten from a small glass (a penny lick), wrapped in a bit of paper (a hokey pokey) or scooped into a cup (a toot). Ice cream has been around awhile, but how long exactly? Before mechanical refrigeration, ice cream and its well-chilled relatives depended on snow and ice either transported from colder areas or packed away during previous winters. It is unclear where or when ice cream was invented but the historical record shows that ancient cultures around the world — Egypt and Persia, Greece and Rome, India and China — all enjoyed sweet iced treats, though the expense generally limited the dish to the wealthiest elites. In the 19th century, however, two American developments would democratize ice cream. 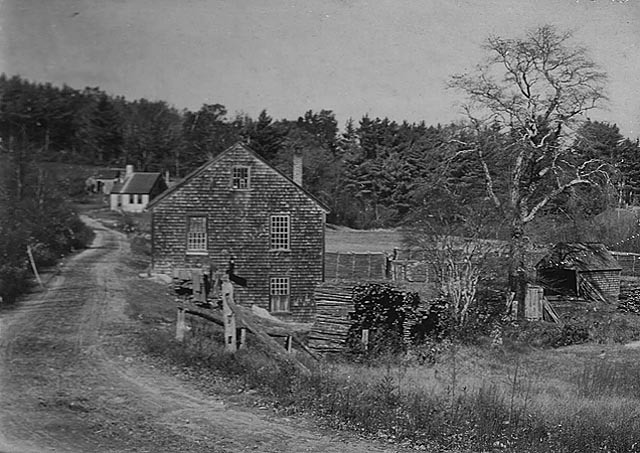 First, in 1805 Boston businessman Frederick Tudor opened the first large scale commercial harvesting business, shipping New England ice as far away as the West Indies and around the country throughout the year. Then in 1843, Nancy Johnson of Philadelphia patented the hand-cranked ice cream freezer. By the later years of the 19th century, the combination meant everyone could enjoy an ice cream party. 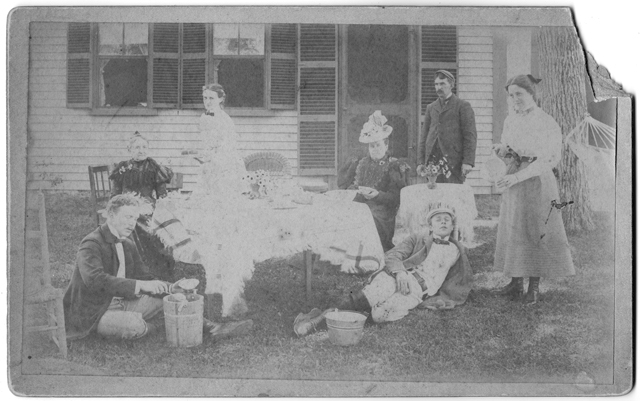 An outdoor ice cream party, no date. In Kingston, ice cream could be bought in stores, restaurants. In the 1940s, Jordan’s Pharmacy on Summer Street in Kingston Center had a soda fountain, where school teams were known to stop in after practices at the Bailey Playground or the Reed Community Building. 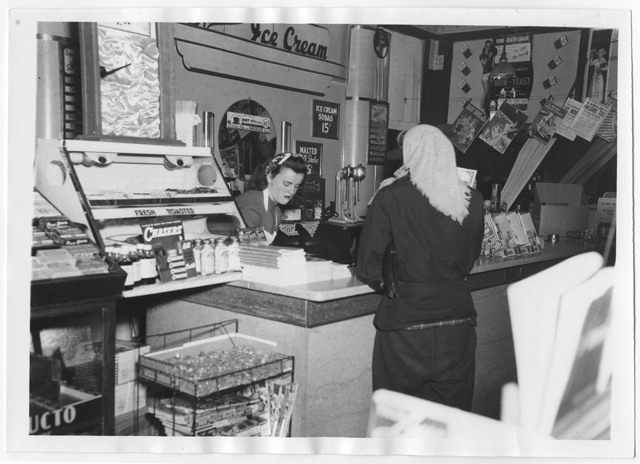 Flora Kite scoops ice cream at Jordan's, around 1940. By Ted Avery. 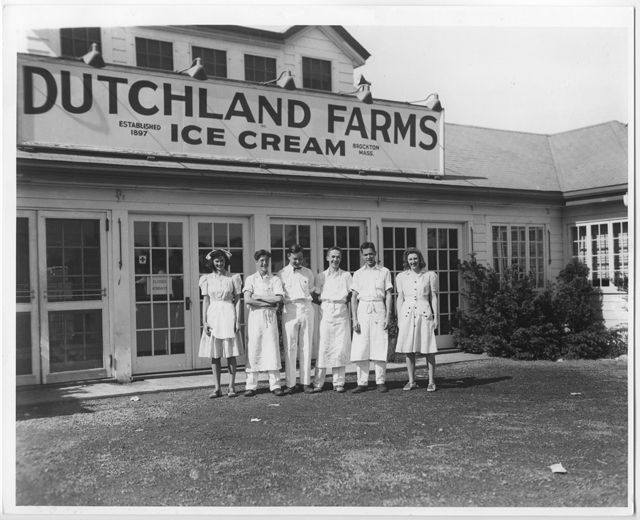 Located on Main Street in the building that now houses the Charlie Horse restaurant, Dutchland Farms was known for its ice cream treats in the 1930s. By the 1940s, the building housed Leland’s Restaurant but ice cream remained on the menu. Today, we are spoiled with the easy availability and many flavors of ice cream. It is still a favorite warm weather treat. Long before the Red Sox/Yankees rivalry and even earlier than the infamous trade that took Babe Ruth from Fenway to the Bronx, a profound difference split the game we know as America’s past-time. There were actually two kinds of baseball – the Massachusetts Game and the New York Game. Derived from an earlier version called Town Ball, itself a descendant of the English game of rounders, the Massachusetts Game was not formalized until 1858 (see the rule book here ), while the New York variety followed the rules of the Knickerbocker Club, dated 1845. The New England version was, in its time considered the rougher, less civilized game, in no small part because the fielders got the baserunner (called a striker) out by hitting him with the ball, a task so difficult that innings ended after only one out and games concluded as soon as one side scored 100 runs, no matter the number of innings completed. After the Civil War, the New York Game surged in popularity and crowded out the Massachusetts style. 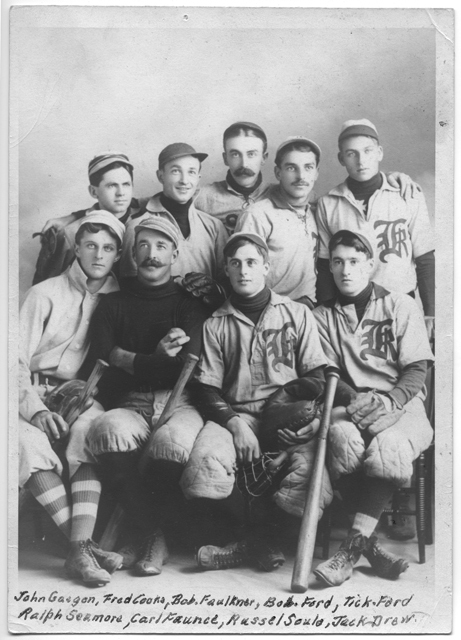 Kingston had a town team by the last years of the 19th century, but very little information, beyond the names added to this photograph, can be found in the Local History Room. We do know that Bob Ford graduated from Kingston High School in 1898 (a classmate of Emily Fuller Drew), while Tick Ford (real name Winthrop) crewed on Henry Jones’ sail boat Kittiwake V and later served as a Kingston Water Commissioner. Based on their equipment, it seems that Carl Faunce pitched while Russel Soule caught. Otherwise, the exploits of the Kingston Town Team remain a mystery to us today. So said the Old Colony Memorial newspaper on July 9, 1910. Police Chief Ephraim Pratt served as Marshall. 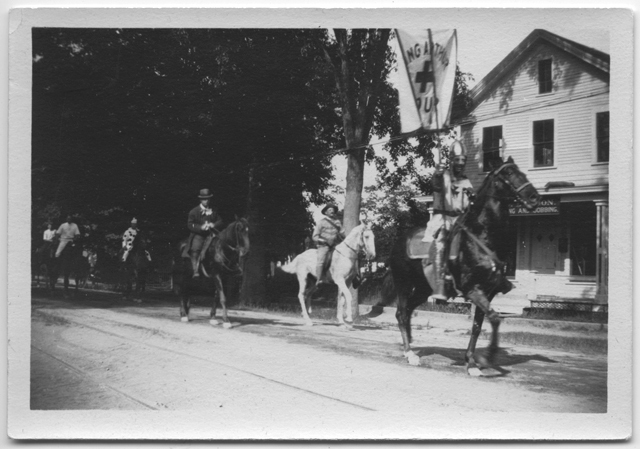 Houses along the parade route sported “handsome decorations.” The procession included riders, floats, automobiles and bicyclists. Most of the floats were pulled by teams of oxen or horses. 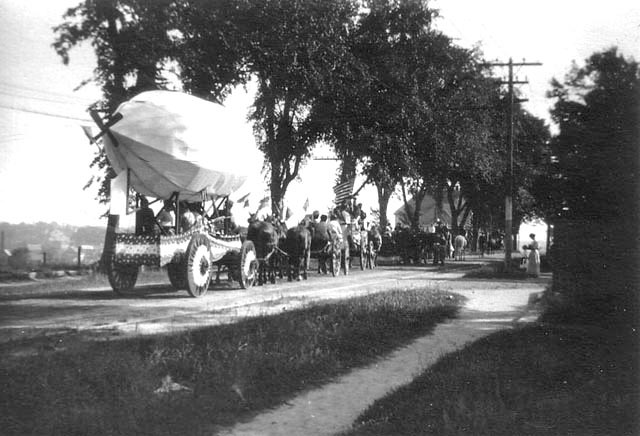 Above, what looks like a dirigible graces one gaily decorated wagon, while below, riders include a knight from the King Arthur Flour Company, a rough-ridin’ Teddy Roosevelt look-alike, a dude and a clown. Festive! 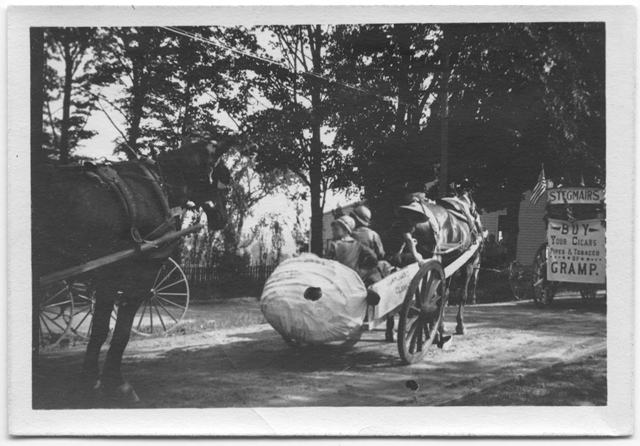 Many of the floats bore advertising, like the wagon of grocer E.S. Wright which pitched Sherwin Williams Paint, or the cart below, unfortunately not listed in the paper, which apparently touted somebody’s clams! 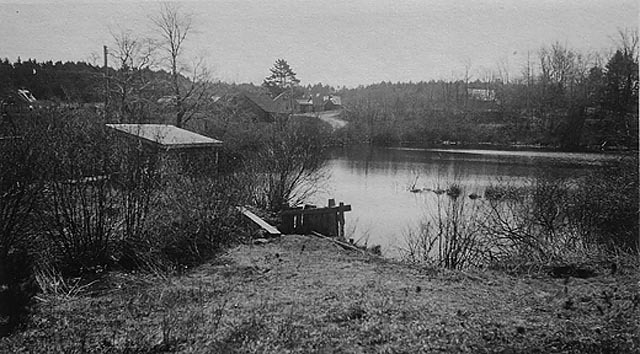 Source: The Old Colony Memorial, July 9, 1910; minutes of the Jones River Village Club, 1910.